My 2017 Year-End Progress Report | Keep It Up, David! I look forward to this post all year! You know I share my weigh-in results and workout progress report every month. But when a new year starts, I put together a report that encompasses the whole prior year. I find it very interesting and hugely motivating, so let’s get to it! 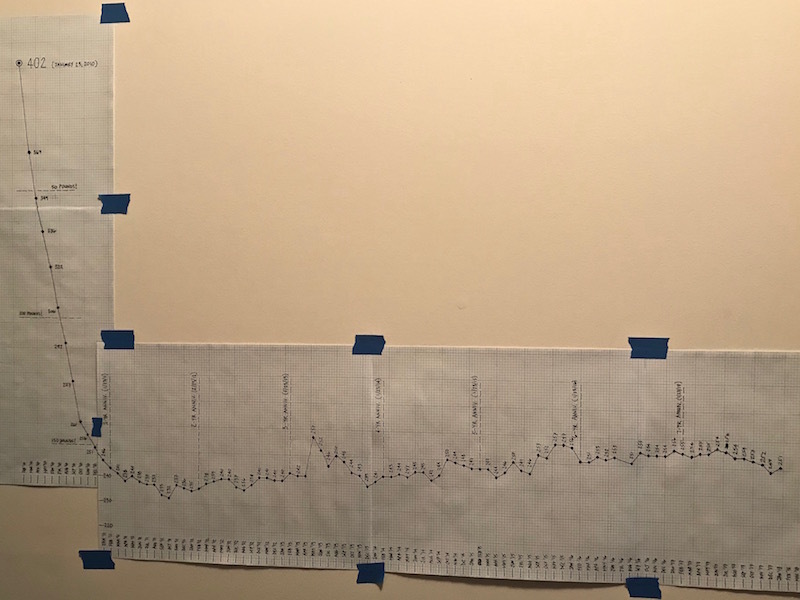 First, my weight loss chart. I did my first-of-the-month weigh-in, and I’m up two pounds. And, of course, there’s the biggest picture. I’m only a few weeks away from celebrating my 8th anniversary of the beginning of this journey. Since that day in 2010, I’ve lost and kept off a whole lot of weight! Now time for my MY YEAR-END PROGRESS REPORT! I track all my exercise on my calendar, including duration, activities, and the distance I covered (if applicable). 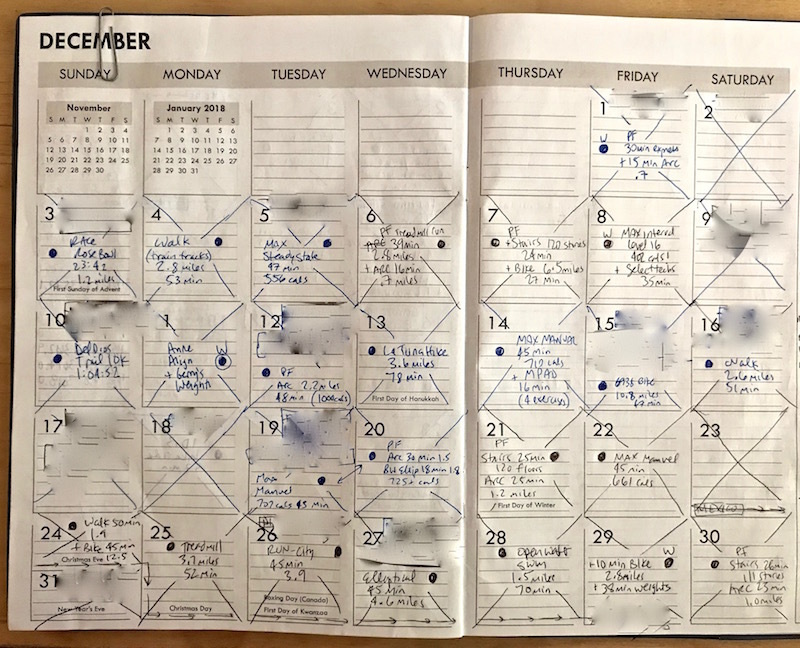 I worked out 25 out of 31 days. I took an extra rest day or two in there, when I was feeling a little under the weather. Four of those workouts focused on weightlifting. In addition to working out more than in 2016, I started 2017 with the goal of finally hitting, for the first time, 300 workouts by the end of the year. Did I do it? In 2017, I worked out… 312 times. WHOA! That’s 13 more workouts than my previous high of 299, from 2015! That means I stayed focused all year. It’s also because I had no major injuries or illnesses that prevented me from working out for big stretches at a time. 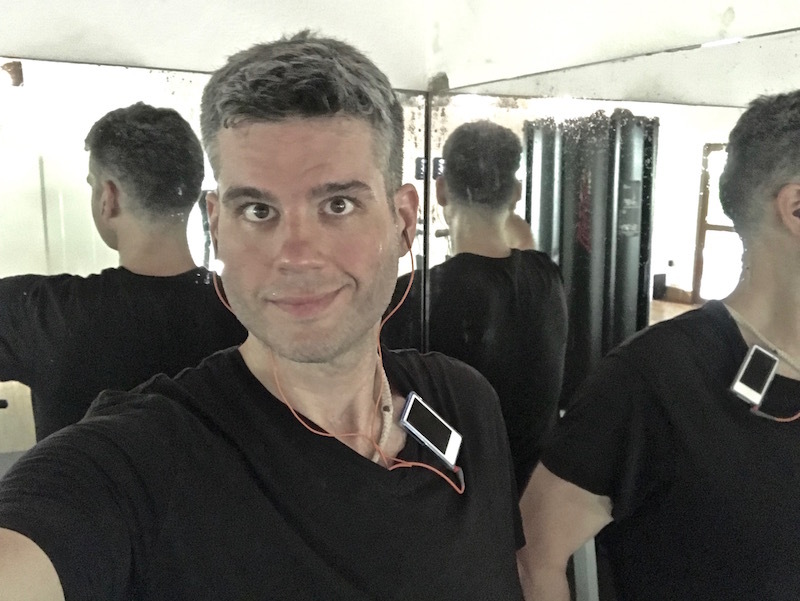 Oh, and check this out: Since my ongoing target is to work out six times a week, I managed to reach that goal precisely. On the nose. 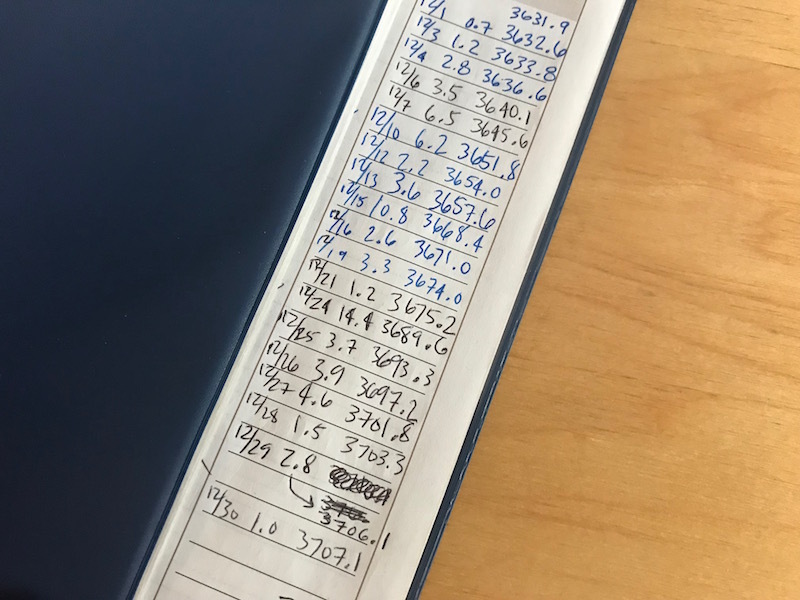 You can check my math: 52 weeks multiplied by 6 workouts a week equals 312 workouts! 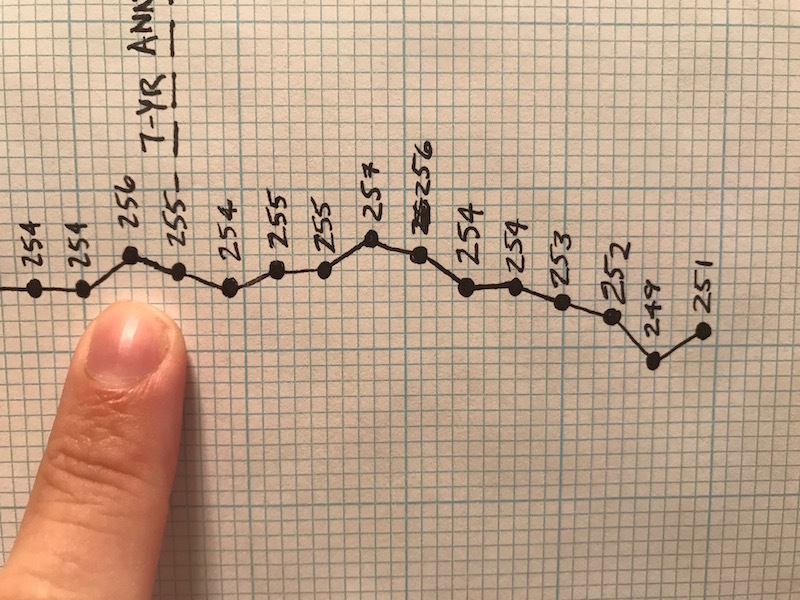 My goals for 2018 are… are… well, hmmm… 312 workouts in a year is exactly where I’ve wanted to be for years, and it’s the first time I’ve reached it. I don’t really want to exercise more than that, since I’m a firm believer in rest days, so I suppose my goal for 2018 is to reach 312 workouts again. Or at least stay above 300, since that’s a nice round number and a challenge enough as it is. I took 23 group fitness classes. This number is lower than in past years, mainly because Slimmons closed last year, but the classes I did take have been great. Group fitness classes are a great way to learn new things, get energized by motivating instructors, and feed off a great positive vibe that can really give you a boost. 52 of my workouts were focused on weightlifting (that’s less than the 62 last year, 83 in 2015, and 109 in 2014, so that’s something to work on in 2018). My workouts average around an hour each. In total, I spent 13 days in 2017 exercising! Combine my workouts from 2011-2017, and I’ve worked out 1,976 times in the past seven years! So close to the 2,000 workout threshold! That’s over 82 days of exercise! The final thing I log on my calendar are my Cardio Miles – the distance, in miles, that I cover doing any kind of cardio. 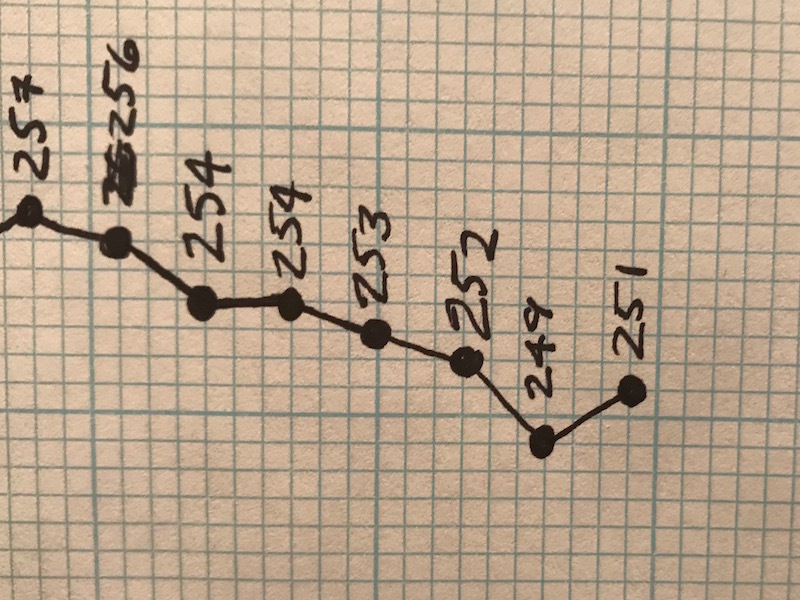 In December, I logged 72.5 miles. …KEEP IT UP, DAVID, throughout 2018! This entry was posted on Tuesday, January 2nd, 2018 at 9:09 am and is filed under Uncategorized. You can follow any responses to this entry through the RSS 2.0 feed. You can leave a response, or trackback from your own site. Good Job David! I’m so proud of you. Great job David!! Something to be proud of! Happy New Year! Consistency and Focus!! Keep being the example!! I’ve been blessed with a great 2017 and looking forward to a wonderful 2018!! And I am staying consistent with applying for Survivor and Big Brother!! Every year since Dec 2009 🙂 Keep Inspiring my fitness friend! Can’t wait to see you on BB or Survivor! Happy new year. Phenomenal year, David! Congratulations on the continued progress. I know how hard it can be to maintain consistent focus and motivation, year round, and you’ve figured it out. Happy New Year! Thanks Jeff! Happy New Year to you, too!